Allow me to officially welcome you into National Peanut Month! Today, the first, is National Peanut Butter Lovers Day! (Fun fact: National Peanut Butter Day is January 24th, and National Peanut Lovers Day is March 15th. Also, National Peanut Butter Lovers Month is November. There are also peanut -brittle, -cluster, -and Jelly Sandwich, -butter cookie, -festival, -butter fudge, and chocolate-covered peanuts days. My dad loves peanut butter. I’m talking PB&J every day for lunch for the rest of his life without ever getting tired of it. Which is pretty much what he does. The man loves PB&J… Genes that were not passed down to yours truly. He might be the greatest peanut butter lover on the planet. SHE could eat a scraped out peanut butter jar every ten minutes for the rest of her life and never get tired of it. Sometimes, when she’s lucky, after my dad makes a peanut butter sandwich, she gets to lick the knife. And even better, once we reach the end of a jar, she gets to lick the inside clean. Anyways, I like peanut butter alright. I mean, it’s fatty, salty, nutty, slightly sweet; it hits me in all the right places and everything, but I just don’t lalalalove it. However, I will use any excuse to write up an impromptu blog post/bake something stupidly decadent, and thus was born this cheesecake. 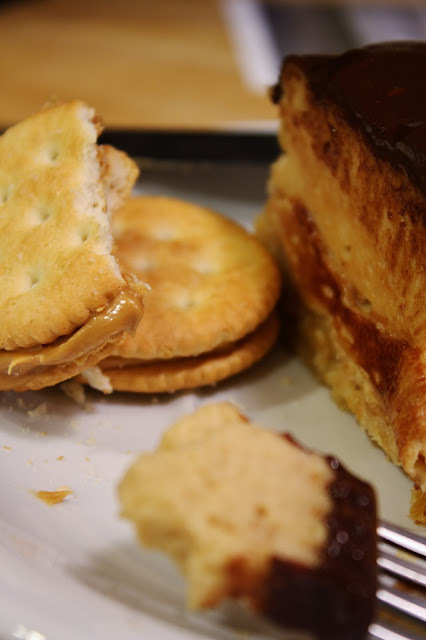 Peanut butter, creamy and sweet, buttery, caramelized Ritz crackers, and a deeply bittersweet ganache (with some peanut butter thrown in, for good measure). There is a wonderfully decadent interplay of flavors going on in my belly here. It’s kind of like a Reese’s cup, but creamier, chocolatier, crunchier, fresher, and, most importantly, you can have more of it, not two wimpy little nuggets in a orange coat. 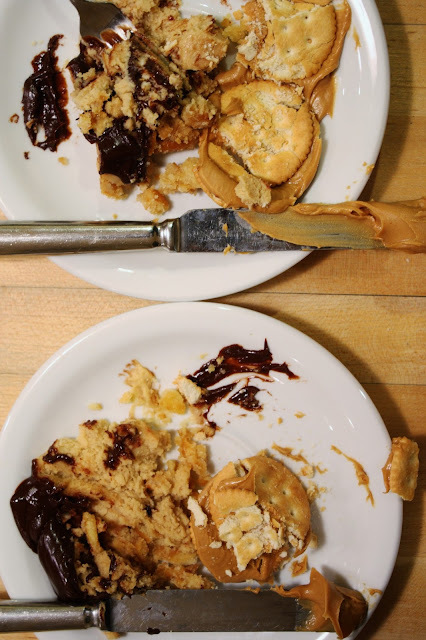 Make it for the peanut butter lover in your life. You will thank me after they sell you their soul. So, I had to shoot these photos twice. My camera misfired while importing or something, and none were transferred to my computer, but all were erased from my memory card. Actually, a really angry camper. Crush the Ritz crackers into cornflake-sized bits. Stir in the milk powder and sugar, then stir in the butter. Press into a greased 9-inch springform pan wrapped with two layers of aluminum foil to prevent leakage. Bake for 12 minutes, until fragrant. Meanwhile, prepare the filling. First, put a kettle on to boil. While beating the cream cheese at medium high speed, slowly add in the sugar. Beat for at least 2 full minutes, until fluffy and completely smooth- no grit. 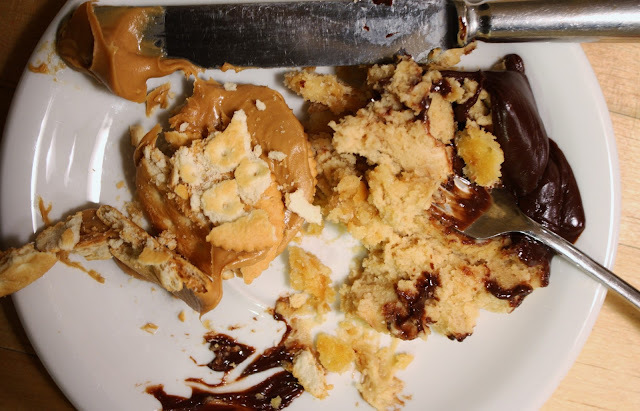 Scrape the sides of the bowl, then beat in the peanut butter, vanilla, and salt. Scrape the bowl again, thoroughly, then, while beating at medium low speed, add in the eggs one at a time, beating between eggs. Pour over the crust, and smooth the top with the back of a spoon. Place into a roasting pan, then pour the boiling water around it (careful!) until it reaches about 3/4 of an inch of the way up the sides. Bake for about 1 hour, until the cheesecake is mostly set, but still jiggles in the center. As soon as it gets out of the oven, run a sharp knife around the edges to unmold them from the pan; this will prevent most cracks. Now either let it cool to room temperature and then chill, or chill it right away. It’s about 30 degrees out right now, and I just stick my cheesecakes straight out into my sun room. For the ganache, put the chopped chocolate, peanut butter, and glucose in a bowl, and heat the half-and-half up until simmering. Pour over the chopped chocolate, and let sit for 2 minutes, undisturbed. Whisk until the ganache comes together, shiny and smooth. 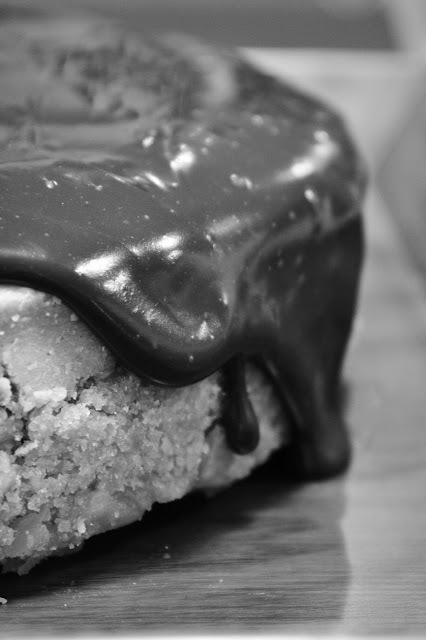 Unmold the cheesecake from the pan, place on a serving plate, and pour the ganache over top. Allow to cool and set before serving. Was shooting in RAW mode, not RAW plus jpg like I normally do. Forgot that Windows Live doesn’t automatically download .CR2 files; instead, for God knows what reason, they were automatically routed to the recycle bin (that’s the misfire part). Found all photos in said bin. Spent 30 minutes converting all .CR2 files to jpegs for editing. Then spent 30 more minutes editing due to noise due to the necessary high ISO used while shooting due to the fact that I decided to shoot at 10:00 pm. Long story short, I hate .CR2s. Also, sorry for the grain, especially on that second gif.